The limited lot of Cypresal has almost run out. So the last batch of it will be roasted on Tuesday. You can order it now on the webshop and we'll send it out Tuesday afternoon. We've been extremely happy with how this espresso turned out. One of my personal best coffee moments of 2010 was tasting that espresso for the first time. Expect chocolate, roasted almonds, caramel, toffee and fully ripe orange. For those not familiar with the coffee, it's a single microlot from the Finca Vista Hermosa farm in Huehuetenango, Guatemala. It's a different lot than the one we currently offer as a lighter roast for filter/french press. They grow three varieties at the farm: 70% Bourbon, 15% Caturra and 15% Catuai. It's depulped, fermented, washed (very thoroughly) and then sun dried. 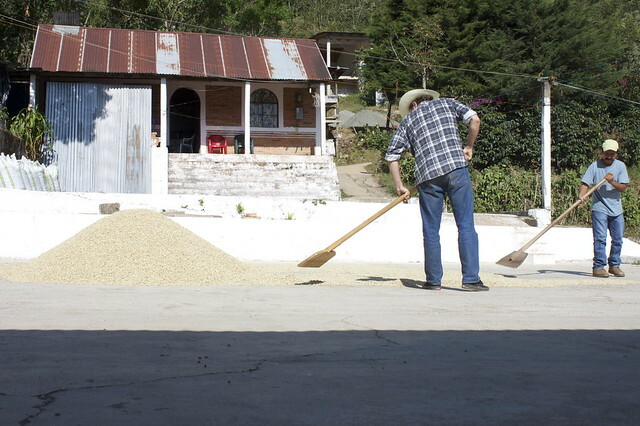 We've bought coffee directly from Edwin Martinez for the past four years now, and look forward to visiting again in late February. This is a nice piece of information about coffee, thank you for sharing it.